No. 66 - of 1921- Smaller Desktop Size! 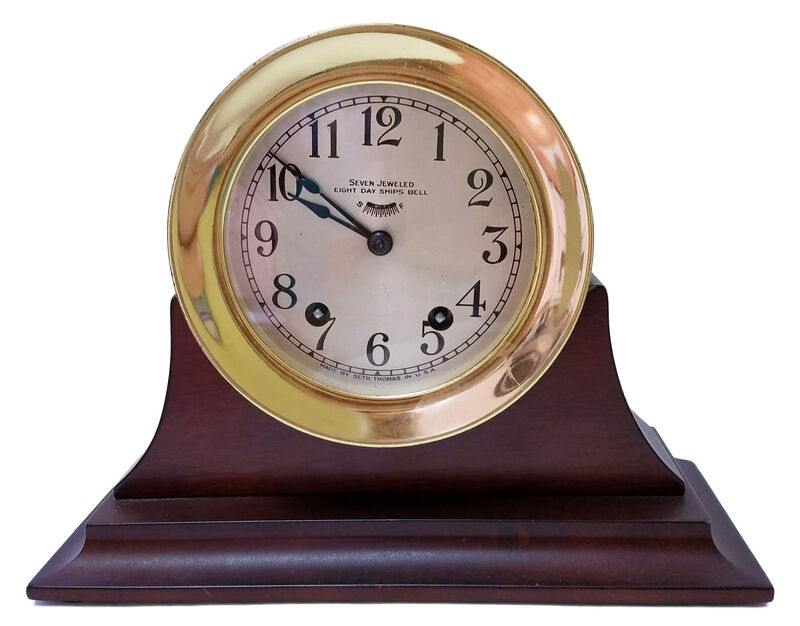 Presented is a very rare, vintage, eight day, 7 Jewel movement, striking bell clock whose design dates to 1921. This one is dated 9-1941 on its Type No. 115, seven Jewel eight day movement and closely resembles, and is the equivalent of, Chelsea's similar design. It is housed in a very heavy, forged bronze deep case with screw on bezel in a convenient desktop size of which much fewer were made compared to the six inch ones. The stand is an optional accessory and is available separately. It is not included. 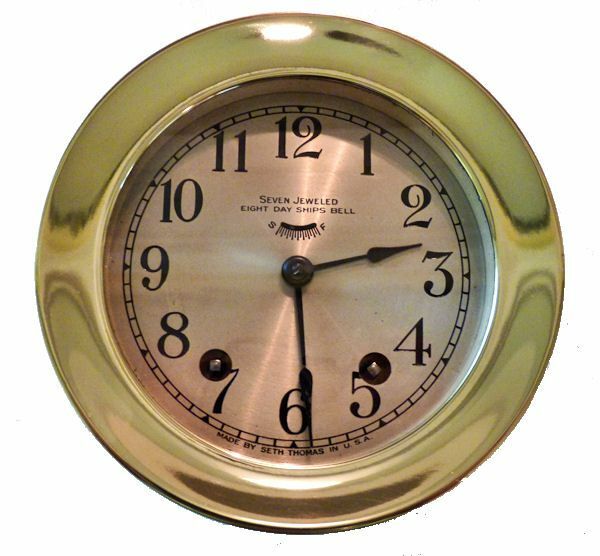 This fine clock is in near new condition as shown by the picture of its movement with a near blemish free dial and case which shows some minor marks. 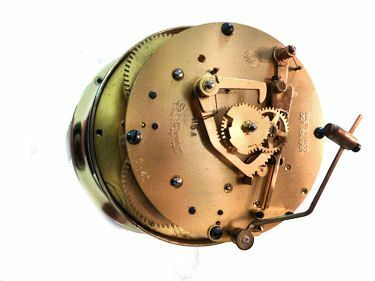 The clock has been recently serviced by a master clock smith, and the movement is keeping good time and rings ships' bells in sequence with authority, resonance and a distinctive tone. It should not be confused with the Mayflower, Helmsman or Corsair models or those with a German movement. SPECIFICATIONS: Forged bronze case with screw on, moisture resistant bezel. The six inch face has a four inch viewable area. The silver plated dial is acid etched and filled in black with Arabic numerals and Copperplate lettering. The precision made 8 day, No.115 movement with 7 jewels, has a compensated balance wheel and Breguet hairspring and spade style hands. 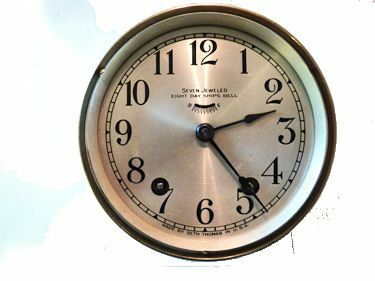 CONDITION: The clock is running strong and keeping good time compared to an accurate quartz watch and is striking the bells each half hour in proper sequence. 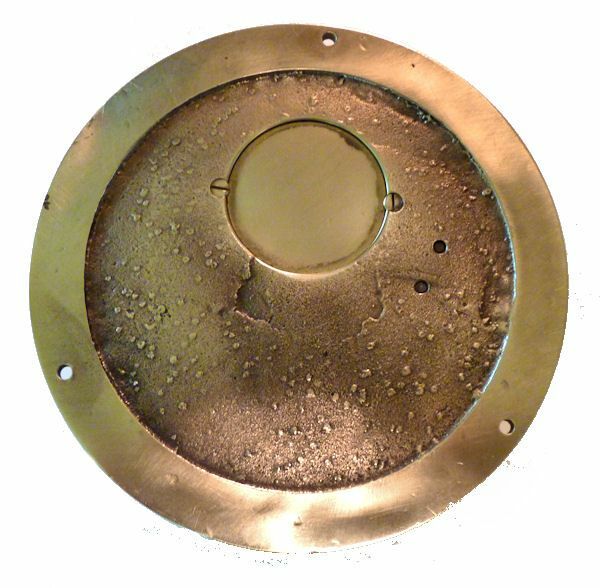 There are some minor casting irregularities on the case which are mainly along the flange. The face has one small light smudge over the “6” and much of the bluing on the hands is faded. Other than these minor marks of age and use, it is in near new condition. The back of the case shows remnants of nickle plating. Since it is almost 90 rears old, we recommend it be wound about every four days for best timekeeping. 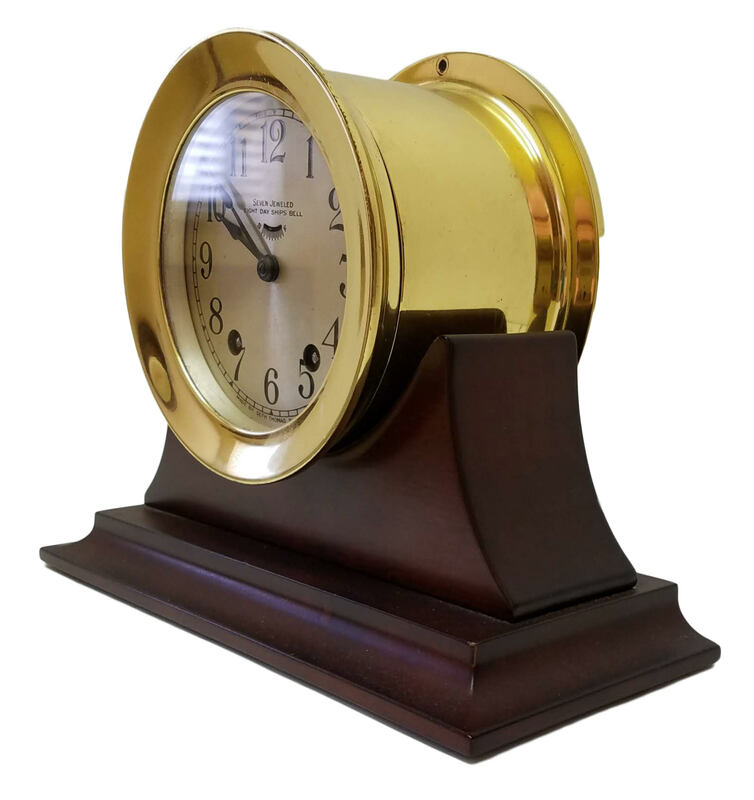 WARRANTY: We guarantee that this clock will be working on arrival and that our description is entirely accurate or your money back. The only conditions are that an email authorization be obtained within three days, and that the instrument is returned in its original condition and packaging, and insured for its full value. Unfortunately, shipping charges are not included in this offer and are non-refundable unless we are at fault. This does not affect our policy on shipping damage which is discussed below.PACKAGING: We take great care in packaging our clocks for shipment which includes bubble wrap, placing in a box, and then placing in a larger box surrounded by impact absorbent material. However, we are not responsible, once it is turned over to the carrier. Full Value insurance is required. In the event of damage due to shipping we will assist you in all respects even to filing a claim in your behalf. Our packaging and shipping are the best available, and is the lowest possible.International buyers welcome, but inquire first. We have satisfied customers in Argentina, Australia, Austria, Belgium, Bermuda, British Virgin Islands, Canada, Chile, China, Czech Republic, Democratic Republic of Congo, Denmark, Estonia, England, France, Germany, Greece, Holland, Hong Kong, Hungary, Iceland, Indonesia, Ireland, Israel, Italy, Japan, Kuwait, Latvia, Luxembourg, Malaysia, Martinique, Mexico, New Zealand, Nigeria, Norway, Nova Scotia, Panama, Poland, Portugal, Puerto Rico, Russia, Romania, Saudi Arabia, Scotland, Singapore, Spain, Sweden, Switzerland, Thailand, Turkey, United Arab Emirates, USVI and the Eastern Caribbean.